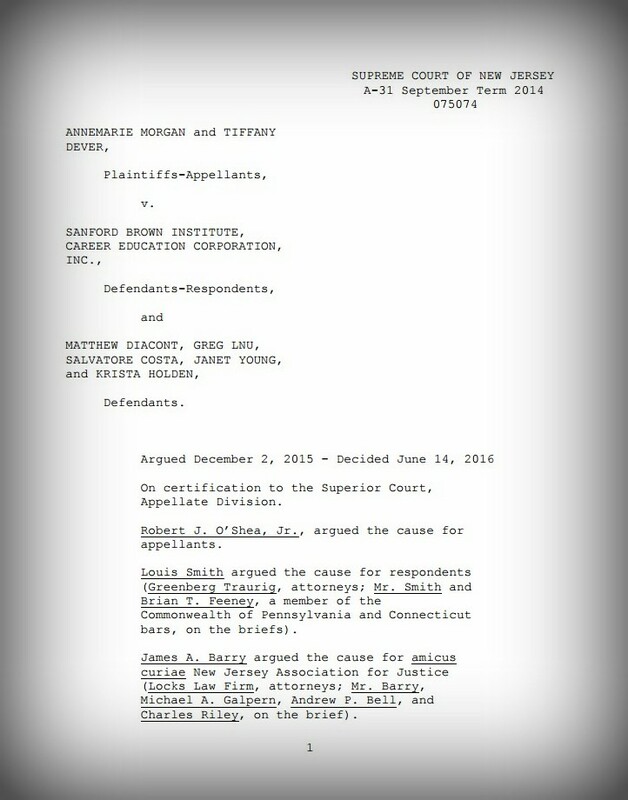 On June 14, the New Jersey Supreme Court released its highly anticipated opinion in Morgan v. Sanford Brown Inst. The case has been closely watched because it is the first time the court has taken up an arbitration-related case since it began experimenting with reining in arbitration during the 2013-14 court term. Despite NJCJI’s best effort, namely an amicus curie brief arguing New Jersey must conform to federal law, the court affirmed that it intends to carve out special rules for how our state will treat arbitration agreements. The case centers around claims by students against Sanford Brown, a for-profit institute of higher education. When the plaintiffs enrolled at Sanford Brown they signed an “Enrollment Agreement” which stipulated that all disputes would be resolved via arbitration. The plaintiffs are upset about the quality of instruction the school provided, the institution’s sales tactics, and the student loans they took out. They brought various claims against the school, including a New Jersey Consumer Fraud Act claim. They alleged that their CFA claim should not be governed by the arbitration agreement because the agreement limited some of the remedies that would be available to them under the CFA if the case were brought in court. The trial court agreed with the plaintiffs, but the Appellate Division reversed, holding that the severability provision also contained in the Enrollment Agreement cut off the provisions limiting remedies, but preserved the arbitration provisions as a whole. 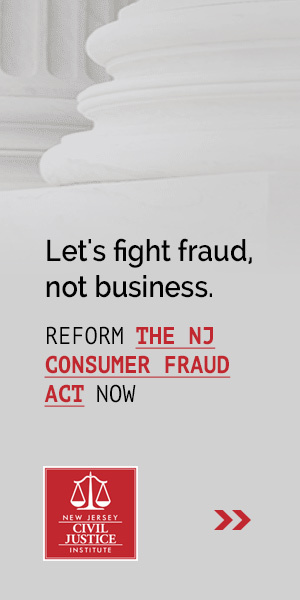 The New Jersey Civil Justice Institute and the United States Chamber of Commerce filed a joint amicus curiae brief to the New Jersey Supreme Court urging the court to uphold the arbitration agreement at issue, consistent with federal law holding that arbitration is an effective, and even favored, means of dispute resolution. Is The Arbitration Clause Valid? Justice Albin authored the 5-1 majority opinion, which doubled down on the court’s recent attempt to rein in arbitration. He was joined by Chief Justice Rabner, Justices LaVecchia and Solomon, and Judge Cuff, who was temporarily assigned to fill a vacancy on the court at the time this case was argued and decided. Justice Patterson dissented and Justice Fernandez-Vina did not participate. In order to distinguish this line of cases from federal law forbidding the disfavoring of arbitration, the court explained that arbitration is at its core a waiver of the right to trial by jury, and under New Jersey law, the waiver of rights requires special notice. There are, according to the court, no magic words that make an arbitration agreement valid or invalid, but the court does provide several examples of waivers that have been upheld on page 24 of the opinion. Who Decides What Is To Be Arbitrated? This opinion also touched on the concept of arbitrability. In short, which claims is the arbitrator in a particular case going to decide, and is it the arbitrator themselves or the court system that gets to make that determination? The majority points out that there is a legal presumption that a court will be the one to determine what claims are to be arbitrated unless there is a provision in the arbitration contract, known as a delegation clause, directing that the arbitrator will determine the arbitrability of various claims. The majority found the delegation clause at issue in this case to be lacking since it was not clearly drafted, and as discussed above, there was no explanation that arbitration is a substitute for going to court. Justice Patterson dissented from the majority’s opinion, arguing that that plaintiffs had waived their ability to challenge the delegation clause since they did not raise that issue at the trial court level. The majority dismissed Patterson’s concerns by contending that a delegation clause simply doesn’t exist in this case, so the federal case law she is relying on does not apply. This case has been remanded back to the trial court for further proceedings. NJCJI will continue to follow this case, and other cases fleshing out our state’s unique law regulating the availability of arbitration, looking for further opportunities to challenge what we believe is bad law. The United States Supreme Court has repeatedly made clear that states must conform their law to the federal law in this area. There is no room for New Jersey to create its own law, particularly if it works in a manner that ends up disfavoring arbitration relative to other means of dispute resolution. If you have questions about this case, or have an arbitration case you would like us to take a closer look at, please contact Alida Kass, NJCJI’s chief counsel. NJCJI and the Chamber would like to thank Gavin J. Rooney, Joseph A. Fischetti, and Amy C. Gromek of Lowenstein Sandler LLP for their work on our amicus brief in this case.